Rigid Spray Polyurethane Foam Market size was estimated over USD 650 million in 2016 and the industry will grow by a CAGR more than 6.5% up to 2024. The growth in the U.S. construction industry will be a chief driver for the rigid spray polyurethane foam market growth during the forecast timeframe. The recovery from the economic slowdown coupled with a stable GDP growth rate in the U.S. will be a major reason behind the nation’s construction industry growth. Rigid SPF is extensively used for insulation and sealing purposes in building roofs and walls. It helps in reducing buildings energy requirements for heating or cooling by sealing air gaps in walls and roofs and by offering resistance to heat transfer. The U.S. Department of Energy estimates that more than 50% of the energy used in homes is for heating or cooling purposes. The department further stated that more than 30% of the buildings’ energy is lost due to air infiltration. The U.S. Environment Protection Agency (EPA) estimates that using insulation and sealing air gaps could save up to 20% of the monthly energy bills. These findings along with the rising demand for green buildings and energy-efficient buildings in the U.S. will propel the demand for rigid SPF in building construction activities. The International Energy Conservation Code (IECC) and Leadership in Energy and Environmental Design (LEED) are some of the major standards implemented to conserve energy in the U.S. The Building Technologies Office (BTO) is tasked with the development and implementation of building energy codes. These codes are developed to ensure increased energy savings in line with the IECC and Standard 90.1. SPF is an effective economic tool to comply with these norms and the energy efficiency standards and government regulations will drive the rigid spray polyurethane foam market in the years to come. Rigid SPFs are primarily synthesized from petroleum-derived feedstock such as MDI and TDI. These materials are derived from benzene, a derivative of crude oil. The crude oil market is highly concentrated and oligopolistic in nature. Hence, the supply of crude oil has been a key factor restraining the market growth. There has been an oscillation in the prices of crude oil due to the supply-demand gap. This has resulted in the price fluctuations of its derivatives. Factors include civil unrest in the Middle East region and embargo on Iran led to the crude oil supply disruption, which has affected the prices of petrochemicals. Therefore, the volatility in prices of raw materials has been a key factor hindering the rigid SPF market. 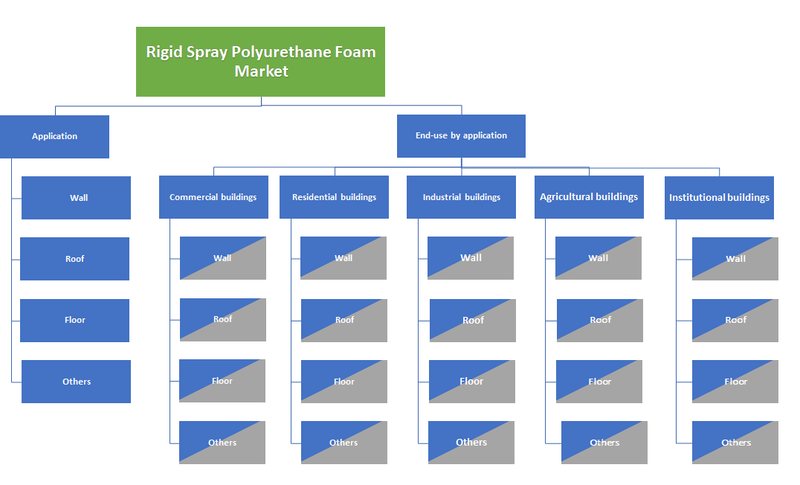 Rigid spray polyurethane foam market is segmented, based on end-use, which include commercial buildings, residential buildings, industrial buildings, agricultural buildings and institutional buildings. Among these, commercial buildings segment accounted for over 30% share of the overall rigid spray polyurethane foam market in 2016 and is projected to show the sluggish growth in coming years. The product is extensively used for insulation, preventing cracks, etc. in building exterior and interiors due to their water resistant, antibacterial characteristics. Residential buildings segment will grow with over 6% CAGR in the forecast timeframe. The product is highly used as insulating material on walls and roofs of buildings as it reduces the overall construction cost and utility bills. The rigid spray polyurethane foam market is further bifurcated into three major application categories which include wall, roof and floor. Minor applications such as ceilings, plumbing systems, etc. have been included in the others segment. Walls application segment generated revenue more than USD 250 million in 2016 and will grow at a significant CAGR by 2024. The segment growth will be driven by the increasing energy conservation demand and various advantages offered by the product such as moisture & termite control, fire protection, enhance the thermal performance, etc. Roof application segment accounted for more than 45% of the entire rigid SPF market share in 2016 and is likely to lose its market share in coming years. This can be attributed to the wide usage of open cell SPF to prevent the cracks on the roofs in place the of rigid SPF. The open cell spray polyurethane is comparatively cheaper than rigid one and this is another key factor for the segment demand in coming year. China rigid spray polyurethane foam market was valued USD 81.6 million in 2016 and will likely grow at substantial annual growth rate by 2024. High population growth and technological advancement in the country is expected to propel the construction sector due to the increasing demand for houses and permanent shelters. The significant application of the product in tanks, pipes, plumbing systems and cold storage of the buildings. This in turn, will spur the Asia Pacific rigid spray polyurethane foam market in coming year. 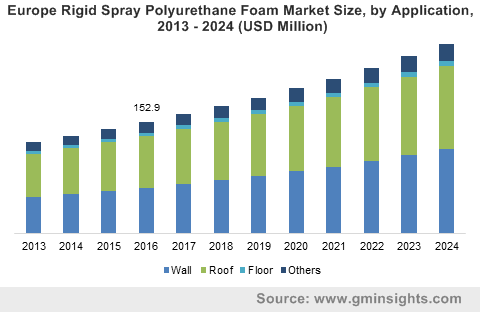 Major players in the rigid spray polyurethane foam market which holds the key chunk include BASF Corporation, Lapolla Industries, NCFI Polyurethanes, Dow Chemical, Bayer Material Science, Icynene Inc, Premium Spray Products and others. The companies are engaged in the product advancement, innovation, development, mergers and acquisition in the market. For an instance, in December 2014, BASF Corporation acquired the business and assets of Taiwan Sheen Soon, which is one of the leading manufacturers of adhesive base materials and thermoplastic polyurethanes. The company operates in the field of thermoplastic polyurethanes, adhesives, performance materials, and polyurethanes. In July 2013, Lapolla Industries launched Foam-Lok AB 2000, a new product for air barrier applications. This will further strengthen the overall product portfolio of the company. Rigid SPF is the chemical compound which is mostly extruded by isocyanate resins and polyol and also known as closed cell spray polyurethane foam. The industry will be chiefly led by the growth in the U.S. and Asia Pacific construction industry. The product is widely used as an insulating material in building walls and roofs. Rigid SPF seals air gaps and prevents loss of heat. It also acts as a water barrier and gives structural strength to walls and roofs due to its rigid nature. Increasing residential, commercial and industrial building construction in the North America. coupled with rising building renovation activities will boost product demand. Government regulations and standards relating to energy usage in buildings will also augment the rigid SPF market as the product can lower a buildings energy costs by a significant amount.